In a recent project – working with developers just started using MS Enterprise Library – I had the need to implement a simple framework for them to deal with relational database as objects in a simple ORM. The idea was to create a layer utilizing Enterprise Library 6.0 to encapsulate the database objects mapping plus having a way for validation. 8         /// Gets the object. 22         /// Gets the collection. 43         /// Gets the object. 79         /// Explores the database defined properties. 101         /// Validates the specified object to validate. 111         /// Validates the specified object to validate. 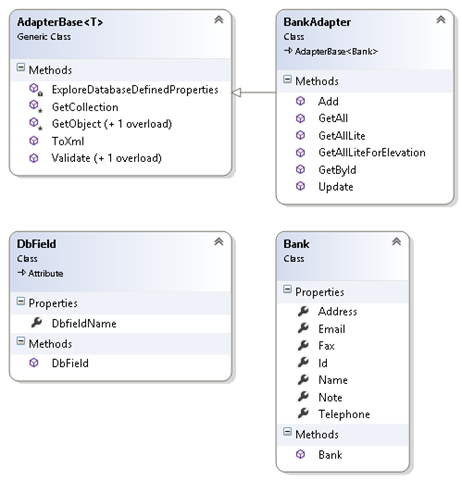 The base adapter have the needed functions to convert relational data – Data Tables or Data Rows – into the respective objects, also have the function to do validation which will be described later in this post. 8         /// Gets or sets the name of the dbfield. 11         /// The name of the dbfield. 16         /// Initializes a new instance of the <see cref="DbField"/> class. 7         /// Gets or sets the identifier. 16         /// Gets or sets the name. 26         /// Gets or sets the telephone. 35         /// Gets or sets the fax. 44         /// Gets or sets the email. 53         /// Gets or sets the address. 60         /// Gets or sets the note. 69         /// Initializes a new instance of the <see cref="Bank"/> class. As you can notice, DbField attribute is used to tell the adapter of the actual field name which comes from the data source. 7         /// Gets the by identifier. 26         /// Adds the specified new bank. 36         /// Updates the specified edited bank. 49         /// Gets all lite. You can notice the usage of the GetCollection and GetObject methods which is inherited from the base adapter class. The solution can be used to teach starters the basics of ORM and the usage of Enterprise Library. What is BankRef in your BankAdapter class you mentioned above?